You can add a photo to your horse record by simply clicking the Insert Picture. If you want to change photos, click on the Delete Picture and insert a new picture. In order to add your photos, they must be stored in a directory your local disk C: drive. For example store them in C:\Horse Photos. The photos will need to be stored on your computer. 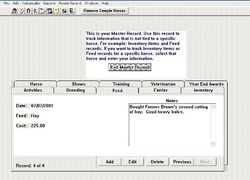 The Master Record is used to record general purchases for Feed and Inventory.